What is the puzzling story behind Russia’s national anthem? Russia has undergone many political changes throughout its history and changed national anthems numerous times. 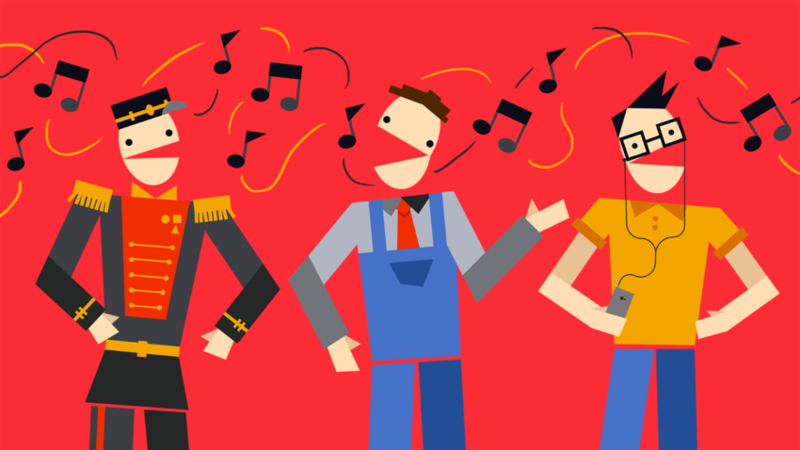 Here we present a brief history of its national song. When Vladimir Putin signed into law a bill establishing a new Russian national anthem in 2000, not all Russians were happy about it. For instance, the famous Russian cellist Mstislav Rostropovich said that he “would never honor this anthem by standing when it is sung.” The reason for this was simple: This new anthem wasn’t exactly new. The anthem chosen in 2000 has the same music — written by Alexander Alexandrov — as the old Soviet anthem, which was approved by Joseph Stalin and was in place from 1944-1991. Moreover, although the lyrics were new, they were by the same author as the 1944 anthem — poet Sergey Mikhalkov. As a result, the whole song is reminiscent of the Soviet period. Why did this happen? In 1917, the monarchy fell, and Russia’s new leaders wanted new songs for the people. These songs were closely tied to revolutionary symbolism — the Russian version of “La Marseillaise,” for example, served as the anthem from 1917 to 1922. In this song, the formerly “strong, sovereign” tsar was referred to as a “vampire,” an enemy the people should rise up against. With its formation in 1922, the USSR adopted “The International” as its national song. Though not officially an anthem, this symbolic song of the workers’ international movement was sung at all official events and celebrations. The song calls for “all the world's starving and enslaved” to rise up and overthrow capitalism. Joseph Stalin changed the Soviet Union’s main song in 1944 to something entirely new. Sergey Mikhalkov and Gabriel El-Registan wrote the lyrics, and the music was by Alexander Alexandov. Stalin’s motivations for the change were political. During World War II, Stalin wanted signal to Western allies that the Soviet Union was not going to overthrow their governments anymore and was ready to cooperate. Switching to a new anthem and away from “The International” was an important symbolic part of this message. El-Registan, one of the authors of the song, recalled in his memoirs that “Stalin told us to add one more verse, a bellicose one about the Red Army, about how we are beating the fascists and will continue to do so…” This was reflected in the verse “We grew our army in battles, we will sweep the vile invaders out of the way!” Nevertheless, in 1977 the anthem was “corrected” by the authorities. It was made to sound more peaceful and removed Stalin’s name. The Soviet anthem remained in place until the country itself ceased to exist in 1991. Once again, Russia needed a new song. From 1991 until 2000, the unofficial anthem of Russia was “The Patriotic Song,” a little-known composition without text that was written by Mikhail Glinka (1804–1857), one of the most famous composers in Russian history. The anthem ran into trouble from the beginning. The Communist party blocked its approval as the official national anthem and demanded that the Soviet one be reinstated. At the same time, many people found it a strange choice since there were no words to sing along with. The government even organized a competition for the best lyrics but didn’t manage to find or approve a winner. Soon after Vladimir Putin was elected for his first presidential term in 2000, he proposed a compromise: return the old anthem but change the lyrics so that they praise Russia rather than the Soviet Union and Communism. As mentioned above, some people strongly opposed the idea, but a majority in parliament approved the bill and since 2000 Alexandrov’s well-known melody has been played at all official events.